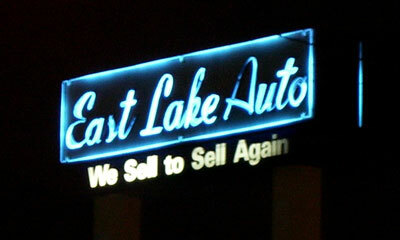 East Lake Auto is located near I-59 in North East Lake section of Birmingham. The current sign pictured here still isn’t as cool as the original neon sign that is no longer functioning. My urban landscapes professor (as well as my old boss in Savannah) would like the urban look of the dealership. Of course, all of this talk just means that I’m going to have to go out there one day and take a picture of the other sign. Don’t forget to check out the rest of the Neon in Birmingham series.